After completing a study of the Civil War, we made "antique" paper by soaking computer paper in strong tea for about a minute. The students tore or crinkled their paper to make it more authentic. Some even added a few dots of red marker ("blood") after the paper was dry. While it was drying, the students wrote a rough draft pretending to be a civil war soldier (or someone writing to a soldier). They had to include correct dates and information about the war in their letter (no gory details). They wrote their final copy on the antique paper the next day. 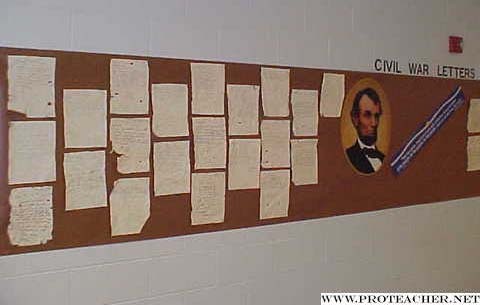 We glued them to brown bulletin board paper, wrote "Civil War Letters" as the title, and added a picture and quote of Abraham Lincoln.